Your product's image is most important and we have the packaging to meet your needs. Choose from standard packaging for video and audio cassettes to computer diskettes and CD's, or we can custom-make packaging for perfume samples, promotional kits, and swatch booklets, just to name a few. Practically any style of vacuum form tray can be sealed or glued into a cover. 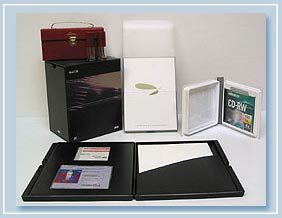 We also make binders and slip cases in all sizes, commonly used in computer software packaging and many other applications, where convaying your company and it's products professional image is a must. into the front cover with the backbone and back cover forming the easel rest, secured by a strap or platform. 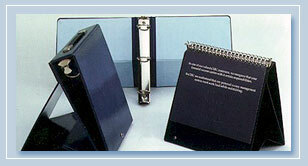 Fold Back style, where the binder folds in half is most commonly used for literature applications.